I finally participated in my first ACP event after being a member of RUSA since October! 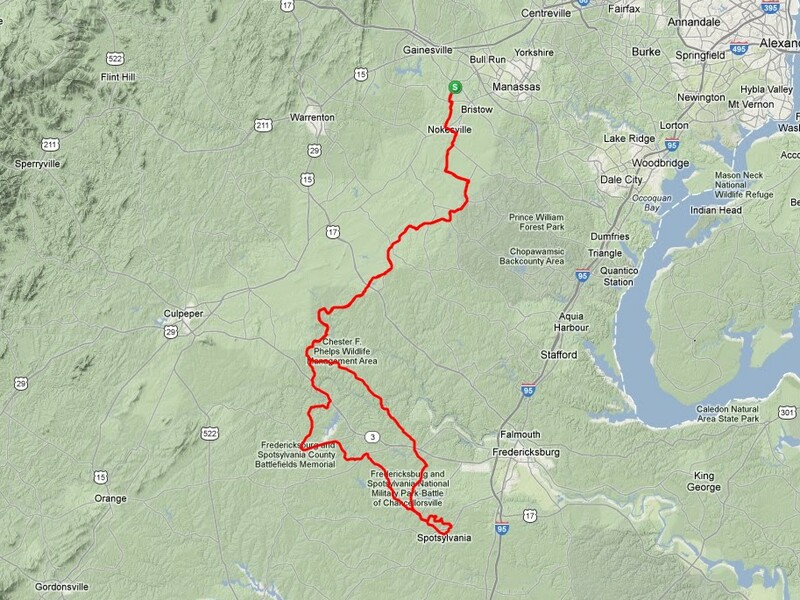 The ride began at Caribou Coffee in Bristow, VA, about three hours from my home. That’s a little too far to manage without spending a night. Therefore, I opted to spend Friday night near Bristow so I could get a good night’s sleep and arrive at Caribou Coffee nice and early. Of course, that was easier said than done! I slept well. Then I went through my usual struggle of remembering how long it takes to don all my layers of clothing (not an issue in the summer). I did well there. Unfortunately, I failed to account for how long it would take to get my gear out of the hotel and down to the car. This was particularly frustrating when I got my first load down to the car and then realized I had left my car keys in my room. 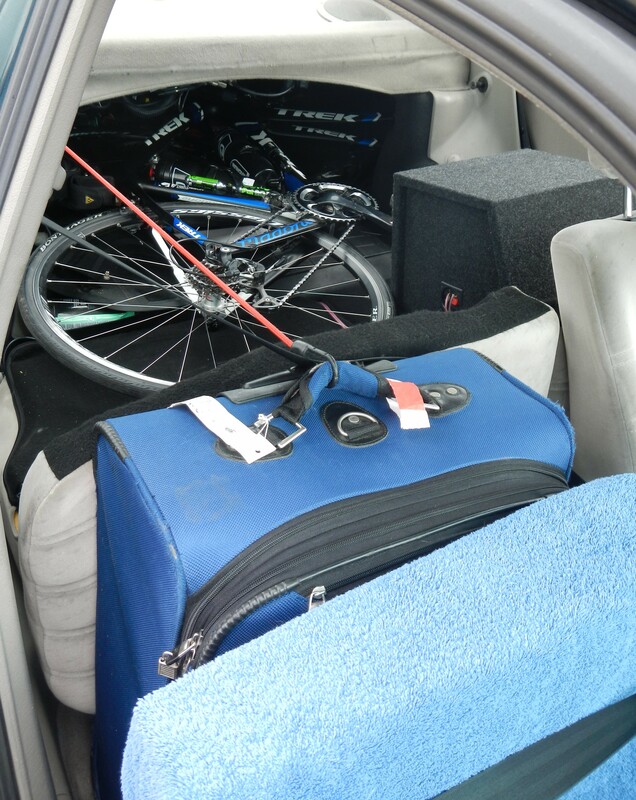 I had to haul all of that stuff, including my bicycle, back up to the 6th floor to find my keys! (slapping forehead) I still arrived 15 minutes before take-off. The efficiency of the organizers ensured that was plenty of time. However, I had little time for the socializing I had hoped to enjoy. Lesson learned, huh? BTW, It was 32-degrees. Therefore, I wore tights, a wool base layer, a summer jersey, a mid-weight jacket, a thick balaclava, Gore mid-weight gloves, wool socks and my winter cycling boots. I carried more gloves, a lighter balaclava, a skull cap and a vest. I also packed “Rainlegs” in case my tights weren’t warm enough. Being used to riding with only three to six riders on local permanents, hitting the road with 47 other riders including several tandems was a great experience! We encountered a few patches of ice on the road. Half of the group got caught at the first traffic light. The herd thinned out considerably once we were all on the road. Being slow to warm up and unaccustomed to riding hills, guess who wound up far behind in less than a mile? That’s right: >THIS GUY!< Haha! I kept a few riders in sight. I think a couple of lucky breaks at traffic lights (lucky for me, anyway) helped me slowly catch up after a stretch. I chatted with a rider named Dave for a few minutes. Later, I spent a lot of time with a rider named Doug. Like me, he had not been riding very much in the past month or so. Our speeds seemed compatible. We caught up to a group at the first control point about 48 miles into the ride. A few riders introduced themselves. Sorry! I’m terrible with names until I use them a bit. I didn’t stay long and had only a light snack. I removed my jacket and donned a vest. I also switched to the lighter balaclava and gloves. I had to repack my handlebar bag since the folded jacket is thick. Doug departed with me. 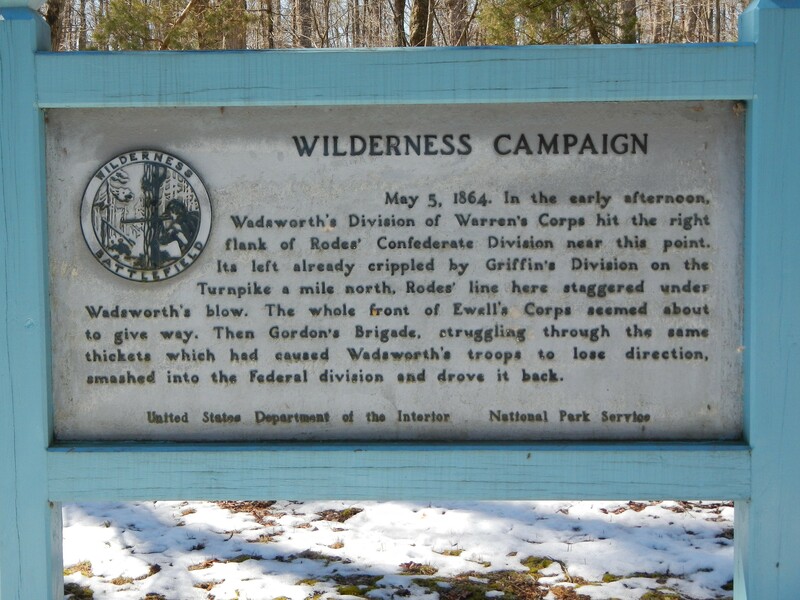 The next stretch took us into “Wilderness Battlefield.” I stopped to take this photo of a sign… “Oh, THAT’S why this ride is called ‘The Wilderness Campaign. '” 🙂 There was an information control where we had to answer a question about a tourist sign. See, kids? Reading comprehension is useful in adulthood! 😉 Once we left the park, I had an unexpected run with good speed. I must’ve been going downhill. 😉 Doug and I separated for a bit. But he caught up once we were climbing again. Somewhere in this stretch, I started hearing a strange rubbing noise on my bike. I wasn’t sure if it was me or another rider, perhaps a fender rubbing? There was no consistency with when or how the sound appeared. I stopped several times along the way to see what was going on. No luck! Perhaps it was just grit from some of the debris I was picking up from snow run-off? I caught up with Doug and a few others at the second information control point. Doug then followed me to diagnose my noisy bike. The noise was becoming a bit unnerving and was occasionally taking on a metal-to-metal sound. Nothing was obvious; and there still was no rhyme or reason to when the sound occurred. Eventually, Doug faded back as I continued. I felt a little bad since I usually don’t leave anyone behind. I appreciated the time I spent with him. It helped the miles tick by. Regardless, I think he understood that I had to ride at my speed. So I kept on rollin’. I caught up with two tandem teams at the last control point about 107 miles into the ride. I left with them. Doug arrived as we left. He was weary, but confident he would finish. The tandems eventually left me. I rode the last 15 miles alone. That was okay. I spent over half of the ride either with company or with a rider in sight. So I was having a good ride although my knees and neck were aching. I returned to a dark parking lot with apparent Caribou Coffee customers outside. They weren’t in cycling attire. So it was a pleasant surprise when they applauded my arrival. They had pizza and snacks and were just outside socializing. Doug arrived 20 minutes later to the same applause. I didn’t beat sunset as I had hoped. I rode about 30 minutes in the dark. But my time improved over my last couple of 200km rides. I finished in 11:34, putting my overall average speed at 11.1-mph, just a tad faster than last week. Not bad when I consider the hills. Although my 13.2-mph rolling average was the same as last month, my shorter stops led to a quicker finishing time. I’m getting better at managing my stops. I think my choice of clothing was perfect! I was never cold and had just the right items to remove or replace. Unlike my previous rides, I did not find myself wishing I had something (other than a quiet drivetrain). Still, I’m looking forward to warmer rides when I don’t have to carry all of this stuff! I ate and socialized for a bit. Then I changed clothes, packed the car and drove home. I got home around 11pm, A LONG DAY! 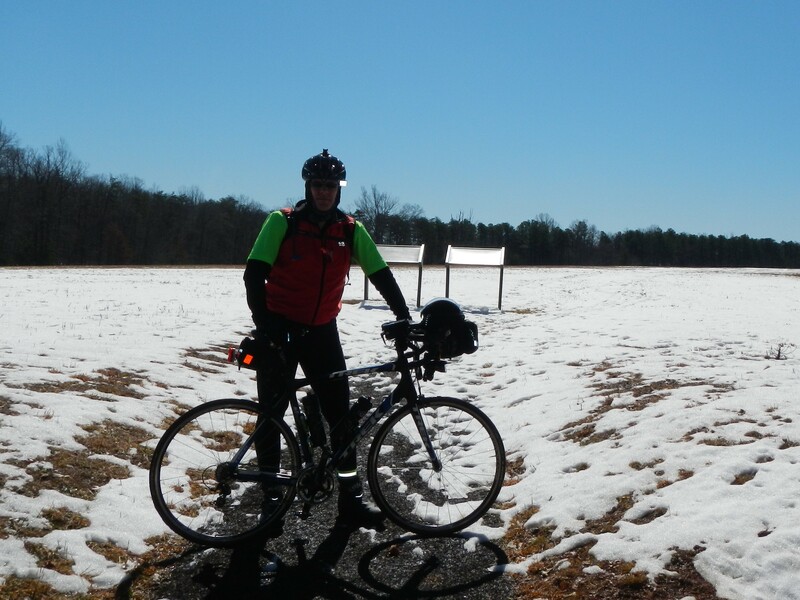 In closing, I want to say the ride was very well organized and ran as efficiently as I could imagine. Heck! Even the store clerks at the control points were quick to initial my control card. They were seasoned pros by the time I arrived. AWESOME! The riders were friendly. I hope to meet more of them in the future and I look forward to my next outing with this group! OH – I believe the source of my noise was a failing guide pulley on the derailleur. I’ll know for sure when I get the parts and get back on the road. I’ll post an update.